It is summer already! And what’s better way to enjoy the summer ?! 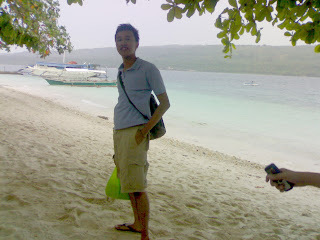 than an extravagant Samal Island hopping. Yes, last Monday together with my classmates as a farewell bash we tour to the different Island of Samal . First stop was Isla Reta. It took us about an hour to reach the place via ferryboat from the Sta. Ana wharf. We enjoyed the place by taking pictures, pictures and pictures. At around 5:30 PM, we took our ride going to the next Island at Kaputian by a small “lantsa” . There is where we rented an air-conditioned room and a cottage plus four tents. By sunset, we took our supper and enjoyed everything. We were playing cards , engaged in some games like “ police2x, kawatan2x”, swimming, some drinking, singing, talking about nothing serious and serious things, having a nice time in Kaputian Beach park until we rested and slept. We woke up in time again to see the moon go down in the west and watch the sun begin to illuminate the east. At 7:00 AM some of my classmates left but with Trecia, Kathy, Kuya Elton, Neil, Menche, RJ, Lorain and her BF, we decided to go to another Island which is in Penaplata . A single motorcycle took us to the place. We went first to Requina’s resident to have a rest for a while and prepare foods for the next stop. We also saved our photo files first in our hard drive for us to have a memory space for the next “picture2x”. At lunchtime, we then had our way to Fernandez Beach Resort. There is where we took our lunch and enjoyed the super exciting game “99”. ( Maybe I will just have another post for this game) Of course, in every game looser must have a consequence? The one who loose eats banana. When the banana were all consumed there’s the “Suman” to replace. Then “ Bulad”. Then, Mango. The worst was the rice, as in eating rice and rice alone. Haha Super enjoy. ! After all our foods were consumed, the next activity was the most favorite picture2x again. Picture here, picture there, picture everywhere. At 7:00 PM, we bid goodbye to the island and went home by a barge. My name is Robin, I'm from the U.S., and my friend and I are starting to put together a Website, which is first going to be about vacationing in the province islands of the Philippines, but ultimately it is to get more people interested in doing charity work among the poor there, especially in medical missions. The U.S. government provides tax write-offs for charity work, even to the point of paying for the entire plane fare there and back, but there is still a lack of interest among young people in doing this kind of work. We are already associated with a small charity organization, but we say if people do charity work abroad, what is wrong with taking a vacation at the same time and enjoying yourself? We think if more young people saw the fun they could have in a trip to the Philippines, doing charity work part of the time when they were there--as the U.S. government would require proof of in order to grant tax credit for the plane fare and other expenses--we think more young people would get involved in charity and do a lot of good for a lot of people. The Website my friend Terry and I are putting together is intended to tell stories about people--both Americans and Filipinos--having fun on vacations in the Philippines, and to show lots of pictures, and after we've put enough of this together to give them a good taste of the fun they could have, we will start posting articles about getting them involved in doing charity work in order to make the trip. There are three articles on your Website we would like to reproduce: "Samal Island hopping," "COPAR turned to a 'Survivor' adventure" and "14-O Christmas party! A big SUCCESS!" Terry showed me a prototype of the first one, "Samal Island hopping." It was very nice, but I said we'd have to ask your permission before we reproduce it. So that is what I am asking you. May we reproduce these three articles? "Samal" had an excellent balance between story and pictures. With the captions you put on the pictures, it was possible to assemble them all in the right order without too much work, putting pictures right above each line from the story. We think your English is very good. There were only a few places where it was necessary to correct your spelling, grammar or capitalization. Plus one place where the sentence was out of chronological order, so we recast the sentence. "First stop was Isla Reta. It took us about an hour to reach the place via ferryboat from the Sta. Ana wharf..."
Likewise there were a few lines without any photos, so we borrowed from the Internet a few photos about generic places, acts, foods, etc. just to fill in the missing spaces. We haven't publicized the Website yet, so no one has seen it except us. May we have your permission to reproduce these three stories, along with your photos contained in them? Saying yes will really help our fledgling charity organization, and ultimately it will save lives. Oh, sorry, I accidently clicked it and posted it twice. You can delete one.